World Amateur champion Curtis Henley (left) gets his reward from tournament director Scott Tomasello. 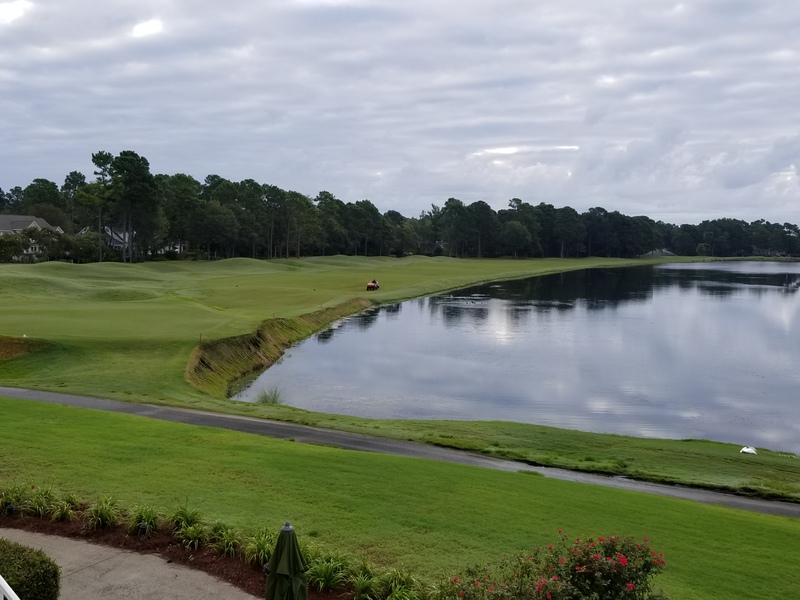 MYRTLE BEACH, South Carolina – It’s definitely a competition, but it also has the friendly touches of an outing as well. 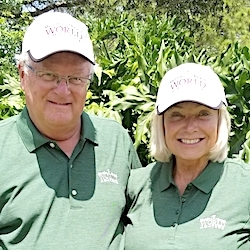 The Myrtle Beach World Amateur Handicap Championship is golf event like no other. With over 3,000 playing in the same community at the same time, a case could be made that it’s the biggest of all golf championships. Though it receives very little media attention, even within its golf-crazed community, the event has endured for 34 years and continues to show steady growth. The latest staging drew 3,010 players — ranging in age from 18 to 89 –from every state except Alaska as well as 22 countries. 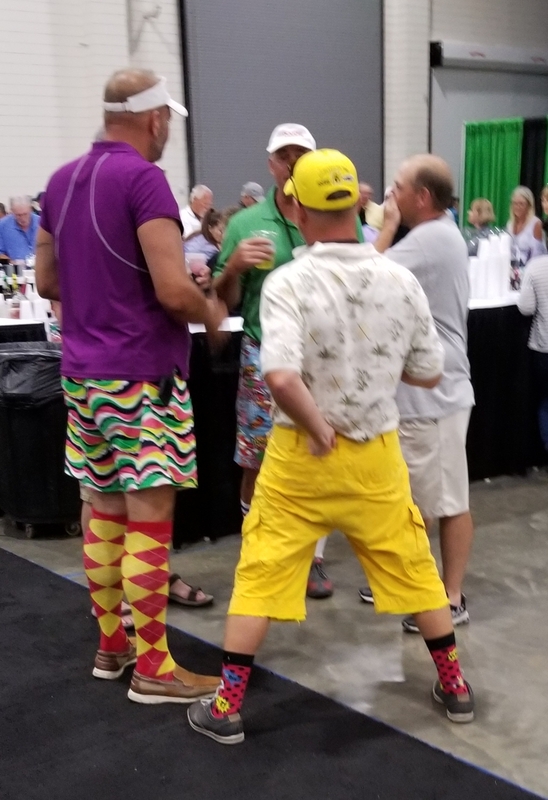 It was two years ago when Chris King, of Myrtle Beach-based Kingfish Communications, and Scott Tomasello, of Myrtle Beach Golf Holiday, suggested that we experience this unique event. They rightfully contended that you couldn’t comprehend the far-reaching magnitude of the event without being a participant. Once we went through that extraordinary experience, it certainly didn’t disappoint. We definitely got caught up in the spirit of the World Amateur Handicap Championship. Tomasello became the tournament director this year and King was part of the organizing Myrtle Beach Golf Holiday, which is celebrating its 50th season promoting the extraordinary variety of golf options available in the 60-mile Grand Strand – an area from Pawley’s Island on the south to just over the state line into Brunswick County, N.C. Over 52 courses were used to conduct the competition, which involved 78 flights based on age, gender and handicap. This year a Just For Fun flight was added for players who didn’t want to compete but wanted to do everything else. They didn’t get the full flavor of the World Am, though. The competition centered on four 18-hole rounds, each conducted in a 9 a.m. shotgun format. 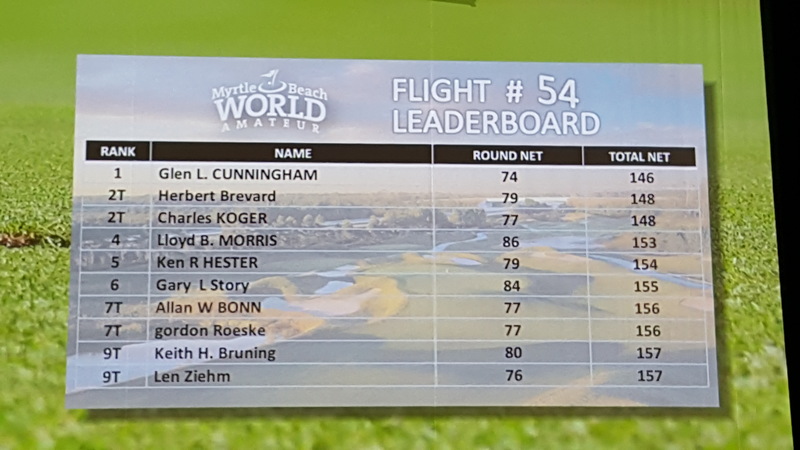 Players got to test themselves on four different courses, and the winners of each flight after those four hectic days went to an 18-hole playoff to determine the World Amateur champion. 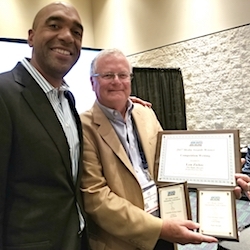 This year it was Curtis Henley, of Poquoson, Va. He shot a net 66 in the playoff off a gross score of 82. 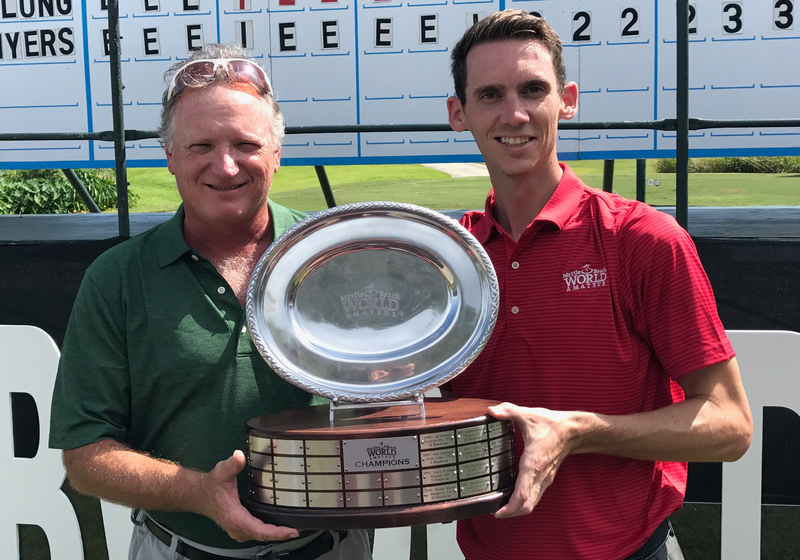 Wes Long, of Hilton Head, S.C., won the gross division with a 1-under-par performance over five rounds, but this event was aimed at players utilizing their handicap. Plus, there’s so much more to the World Amateur than the golf itself. The World’s Largest 19th Hole was always a colorful event. The gift bag – ours consisted of a logo hat, shirt, pullover, towel, thermo mug and bag tag; a Nexbelt; a $20 credit for purchases at a PGA SuperStore; and a souvenir program — is extraordinary. So is the off-course entertainment. 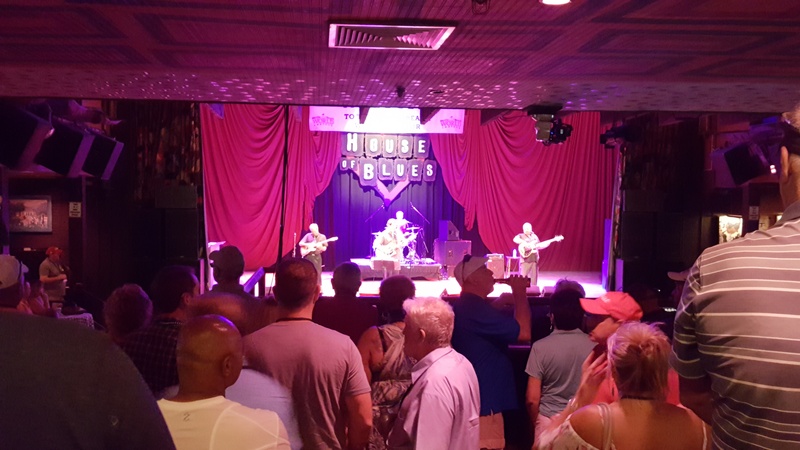 This year’s welcoming reception was at the House of Blues. 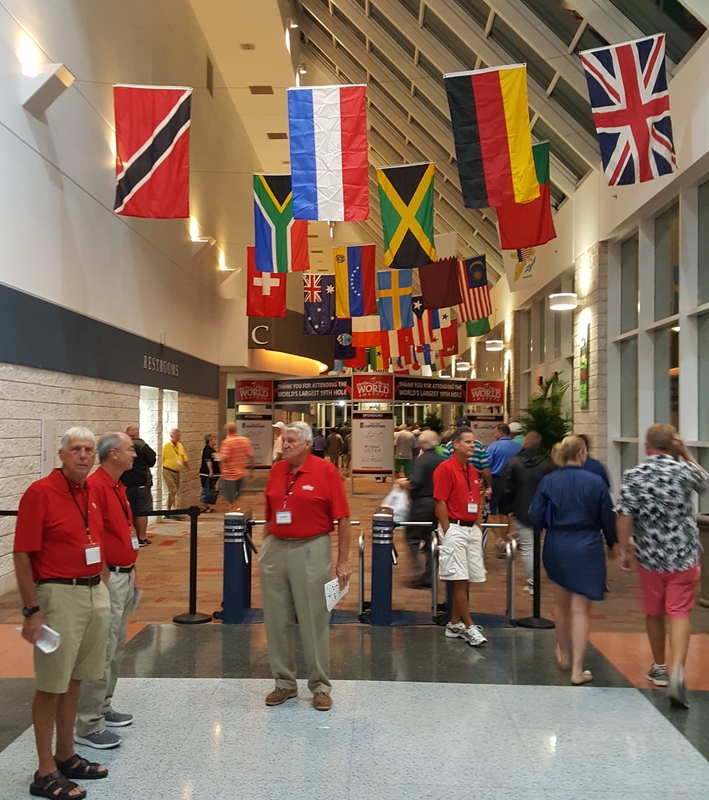 It was packed with players, family members and friends and that was also the case every night after each round at the 120,000 square foot Myrtle Beach Convention Center — the site of the World’s Largest 19th Hole. The World’s Largest 19th Hole was clearly that. This was a lot different than your usual pro-am party. Each night there was dancing to the music of live bands, a golf expo that included 60 exhibitors, on-stage programs featuring celebrities from The Golf Channel, putting and chipping contests, billiards matches, youth games and – best of all – food stations offering small portions of the cuisine served at the area’s top restaurants. Oh, yes, there were open bars at various locations each night as well. HANDICAPS: Myrtle Beach Golf Holiday takes them very seriously. While most other net competitions use handicaps mainly to group players of similar abilities, the Holiday doesn’t just take just a player’s word for his handicap. 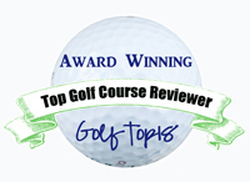 There must be documentation from a recognized golf organization, and that’s not always enough. If there are some suspicious scores the Holiday is not reluctant to retroactively disqualify a player from the competition. There have been some unhappy, disgruntled players over the years but handicaps can’t be taken lightly in an event of this nature. Those supervising that end of the competition are firm but fair. The jam-packed welcoming reception at the House of Blues got the World Am off to a rousing start. In our case Joy questioned her handicap, believing it to be too low, after the first round. A check of the Chicago District Golf Association records revealed that the Holiday was in error in making her handicap adjustment. It wasn’t just corrected verbally; an email confirmation arrived the next morning. That’s what I’d call paying attention to detail, especially considering the 3,000-plus players involved. 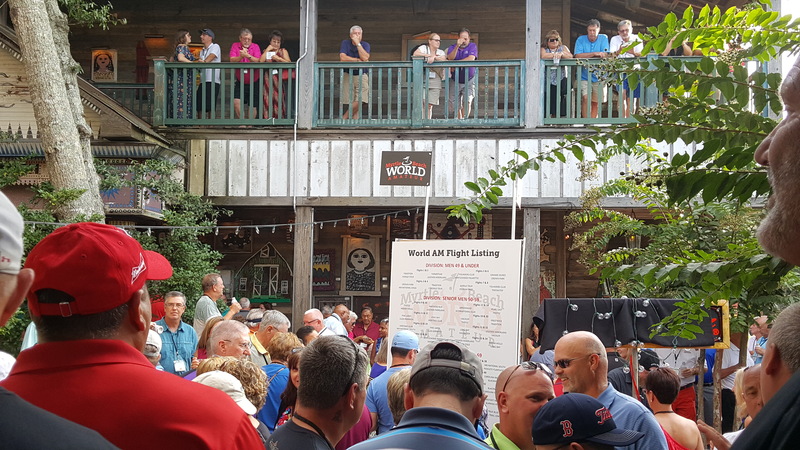 After each round the Holiday staff prints out standings for each flight and has them ready for the 6 p.m. opening of the World’s Largest 19th Hole. The top 10 in each flight are spotlighted on rotating video screens throughout the evening, and making the board is an honor worth savoring. At least I did, after being tied for ninth place in my flight after Round 2. THE PLAYERS: They are grouped into flights of about 40, and not just by handicap. Men are also divided by age, the oldest one being for those 80 and above. There aren’t enough women to differentiate by age, so they are divided strictly by handicap. I was placed in a 70-79 age group flight in which all 40-some players had handicaps in the 18-21 range. It’s intriguing how compatible players can become from a scoring standpoint when handicapping is done properly. I had a hot second round and defeated one of my playing partners by a stroke. He went on to finish seventh in our flight while I struggled in the final 18 and was in the middle of the pack at the end. Live bands were featured at both the welcoming reception and World Largest’s 19th Hole. Joy had a similar experience. She also finished in the middle of the pack in her flight but matched the score of the eventual flight champion when they played together. 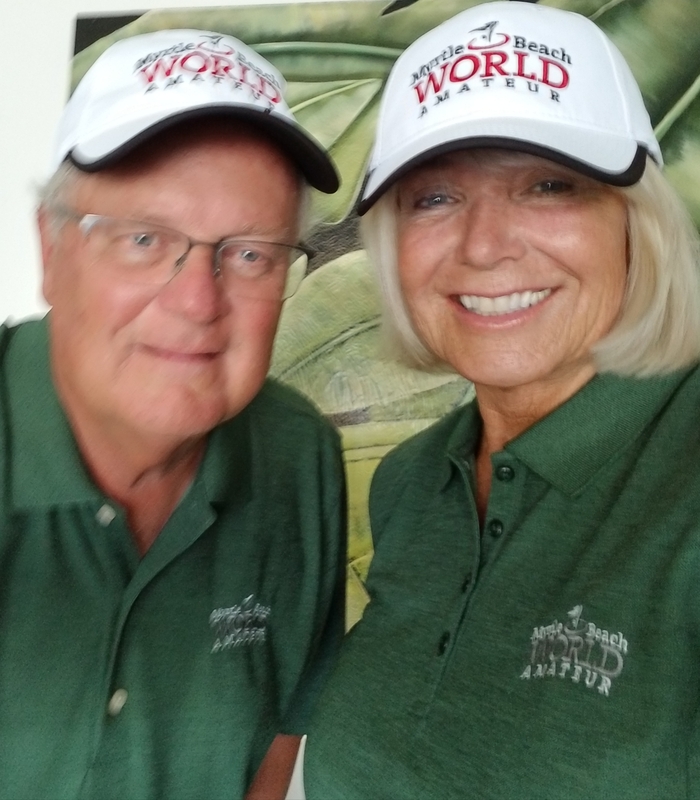 Both Joy and I played with 12 different players over the four days, and every one of them had played in at least one World Amateur previously. In my last round I was paired with one who was playing for the 20th time and two who were 10-year veterans. Seven players in the event have played in all of the previous 34 World Amateurs. That underscores the popularity of the event. You come once, and chances are you’ll want to return again and again. My most memorable partner was Roy, from Florida. He requested before teeoff that we help him find his ball. “As far as the state of Florida is concerned, I’m legally blind,’’ Roy informed us. He did need some help finding some of his shots, but was still a most pleasant playing partner. In the last round my cart partner was Skip, Roy’s brother from New Jersey. He was a fun guy, too. 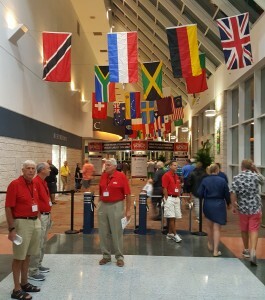 Flags of the players from all the countries gave the Myrtle Beach Convention Center a festive look. Joy’s favorite playing partner was Isabel, from Texas. Isabel and her husband had their flight to Myrtle Beach cancelled when Hurricane Harvey started inflicting serious damage in their home state so they drove 20 hours to get there. Unlike us, they came in one car – and that complicated daily travel. Joy alleviated their situation by driving Isabel each morning and we made friends in the process. COMPETITION: All my playing partners seemed to think about golf the way I do: it’s a game, competition is fun and enjoy the experience no matter the result. You adhere to the rules, do the best you can and get to know your partners. The conversations I had with mine extended well beyond golf, and we quickly developed a spirit of camaraderie. Joy’s experience wasn’t quite that good. While she was happy to be competitive in her first taste of this new format, she did run into one partner who was adamant that she knew all the rules – but really didn’t. They didn’t talk much as the round progressed, but the other players were nice. Not every player was ready for the World Am, either. There was one in my flight – a most pleasant fellow, I was told – who shot 146 in the first round. His slow play frustrated his partners until he decided the event wasn’t for him after playing six holes in Round 2. My brief moment in the sun: a spot on page one of the 36-hole leaderboard. DAILY ROUTINE: You need to plan for each day, as the courses can require drives of up to 40 miles. Fortunately, we came in two cars. We would check the distance to the next day’s course the night before. My first round was 25 miles to the south, my second 25 miles to the north. Closest round was a 15-minute drive. Joy’s situation was similar. We swung into action each day at about 5:30 a.m., left for the course about 7 a.m. and met up again at the hotel in late afternoon. We usually had an hour or two to clean up before heading to the World’s Largest 19th Hole. Weather was a factor throughout. I was caught in a downpour late in Round 1. Joy wasn’t, but nightly storms left the courses soggy in the mornings. We had to play cart path only with a lift, clean and place policy in effect in the second and third rounds. That wasn’t something that was appreciated by any of the players, but it was a necessity. Joy encountered one course with a hole under construction, but that was accepted as a unique challenge rather than an inconvenience. EPILOG: I’ve played in tons of golf events, but none like this one. The World Amateur is for serious, recreational players. All putts must be holed out. There’s no picking up your ball at frustrating times and moving on to the next hole. You obviously need to keep a handicap to participate and must accept the likelihood that some scores will be higher than you’re used to shooting. You should have a sense of humor if you’re thinking of playing in the 2018 World Amateur next August. The cost of doing that varies, depending on your transportation requirements and dining options. The basic entry is about $600 per player, and that’s well worth the value for a memory that will be long lasting. Prestwick, a Pete and P.B. Dye design, may have been the toughest course in this World Amateur.